Juice them up. Or brown them down. A new way to tweak your tone. 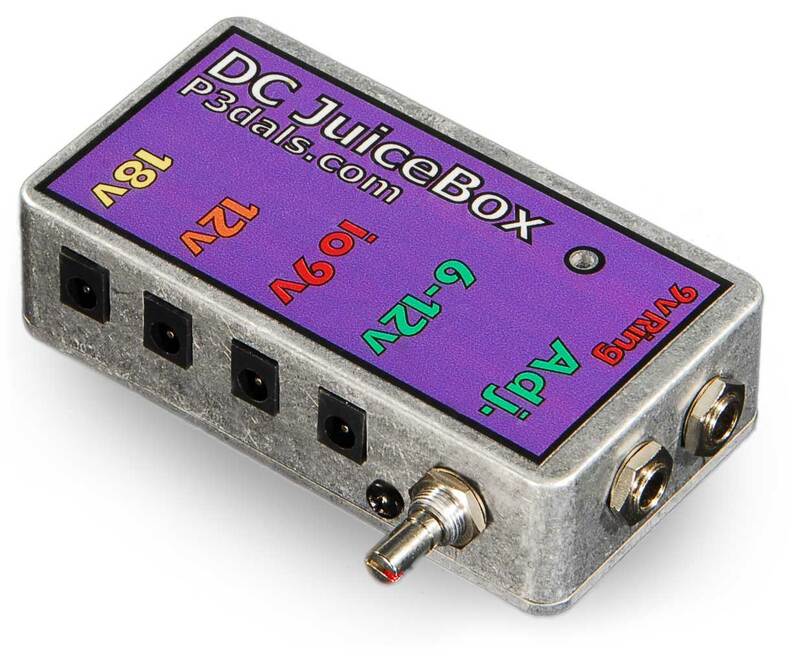 DC JuiceBox quietly transforms 9V to 12V, 18V and more, to provide isolated, linearly regulated, filtered, high-current outputs. Fully P3-Ready™ and works with practically any 9V power source, including GAGA, P3, bricks, warts, etc. You've controlled volume for years. Now control your pedals' voltage. Boost headroom. Cut noise. Slam tone. Overdrive your overdrive. Quality power for quality players and quality tone. Here is professional pedalboard power conversion for serious musicians. "Turn up to 12" to extend headroom, cut noise, slam tone. Variable voltage allows "brown down" and "juice up" for tonal effects. Convert any 9-volt DC power source into 12-volts DC, 18-volts DC, and variable voltage. P3-Ready™ -- audio thru, P3 pick-off, and P3 pass-thru. Power may be supplied via a standard barrel plug or P3 (1/4-inch TRS audio cable). Translates between P3 and standard Barrel Jack power. Converted Outputs are isolated, regulated, filtered, high-current. Patented and patents-pending. American-made in USA.